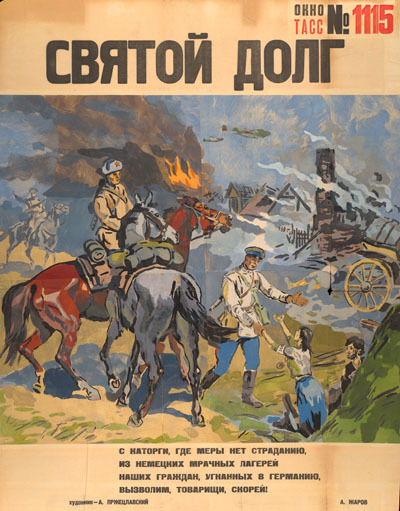 Maintaining morale on the home front was an important goal of the war posters produced by the Russian state. 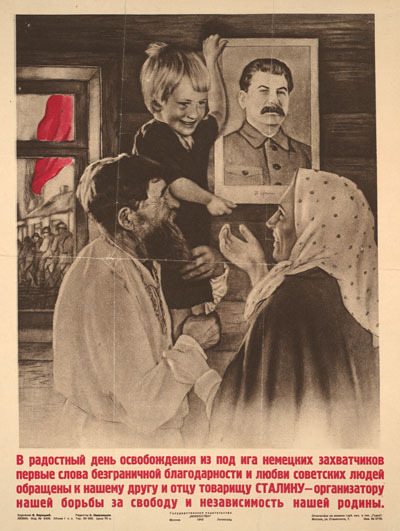 This run of posters about life at home for the Russians has four topics. They are the part played by women, the heroism of Russian soldiers, the defence of the homeland and the reliance on the comforting presence of Russian religious memory. These topics sometimes overlap in individual posters. 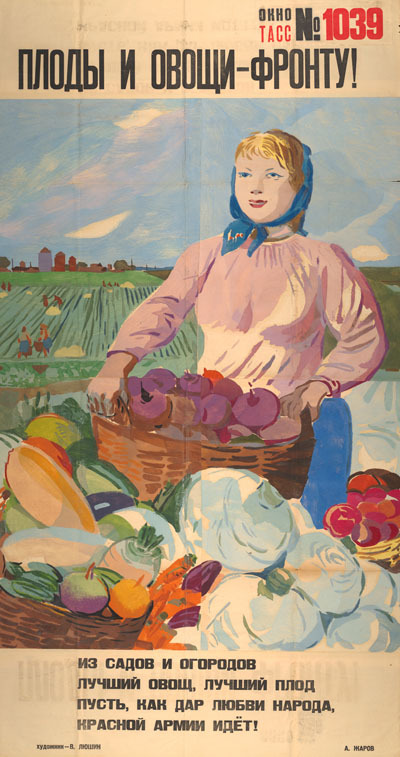 This portrayal of Russia had its roots in the arts of the 1930s, produced under socialist realism. It also subtly reminded the spectators of their rich, long-standing traditions. To view more information about the posters click the “Explore” buttons. Women in Russia had been granted equality by the Revolution of 1917. This equality largely meant the opportunity to work on the same footing as men. 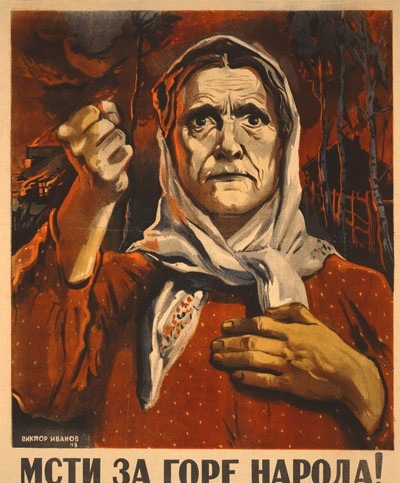 The women in the posters include peasants and military personnel. However, their roles as mothers and sisters of soldiers also occupy a significant place. Whether labouring on the collective farm or caring for their families, women played essential roles on the home front. Where there are women shown, the posters tend to celebrate their roles. Occasionally, the women take on very public tasks such as recruitment or serving at the front. As mothers, many women were proud to send their sons to the army, or so the posters said. The title, though, is bitter. The mother urges the soldier-sons to ‘avenge the people's grief’. The posters display very few Russian men apart from soldiers. 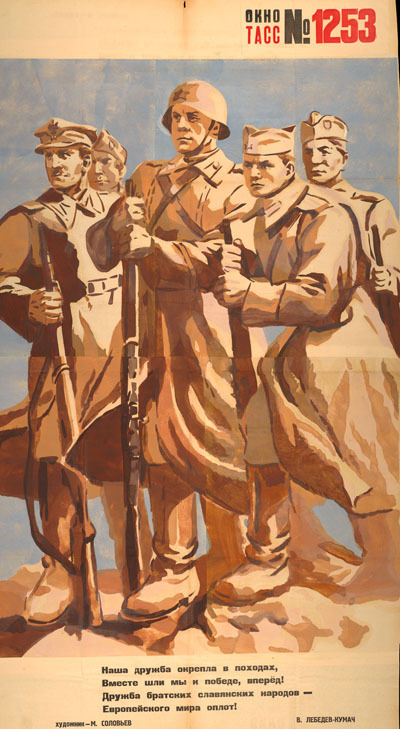 There are some historical figures, but the image of the soldier comes almost completely to stand for the Russian man. Russian losses in its armed forces as well as among civilians were great. An estimated eight and half million military gave their lives to defend the country, while close to 27 million died in total. 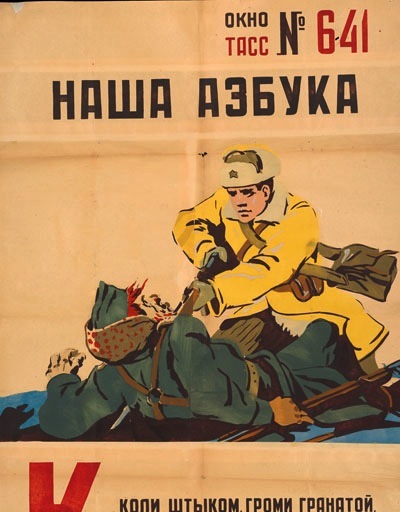 The heroism of the Russian soldier was glorified in the posters. People on the home front had to believe they were being strongly defended. If that meant brutality then so be it. Killing the enemy was central to the soldier’s manly role as much as were images of brotherhood and a modern knight in shining armour. The defence of their homeland united all Russians, and land or seascapes were an important motif used in the posters to call up love for their own country. There was a risk to morale in showing war-torn landscapes, burning farms and suffering Russians. Overemphasising the destruction at home might have an effect at odds with the need to urge the people to defend their country. 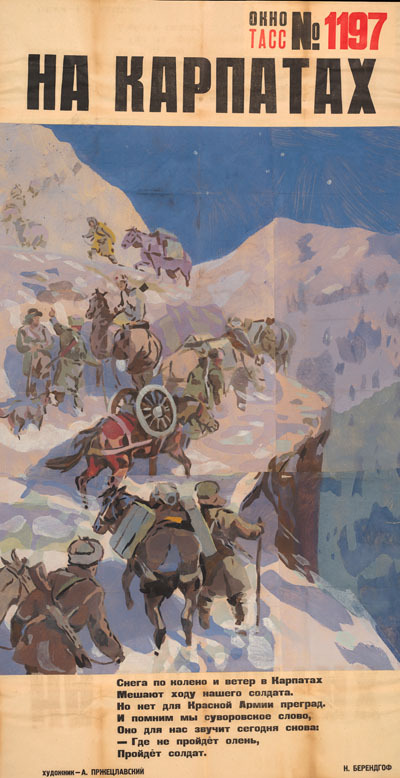 The trick was to counterpoint the damage with moments of Russian heroism as prisoners are liberated, fleeing enemy soldiers are run down or the Red Army traverses a mountain in winter. The posters seem to say that the land, seas and mountains are unchanging, in spite of the damage being wrought by their enemies. This depiction of raids on the occupied Russian shoreline from the sea called for talented artists. The Russian homeland under threat: it was a ‘sacred duty’ to defend it. Some of the posters are deeply religious in their composition, or borrow from the familar images of religion. They are designed to convey a patriotic message and to offer comfort. Visual art created under socialist realism before WWII had also been sometimes been modelled on a religious base. They hoped in some ways to inject the old religious power into the secular presentation of Stalinism. Images of the wounded and dying, especially, called on religious stereotypes. This army nursing sister administers ‘the waters of life’ to the suffering soldier. Stalin is held up as an icon in the traditional manner, to bless and be thanked. 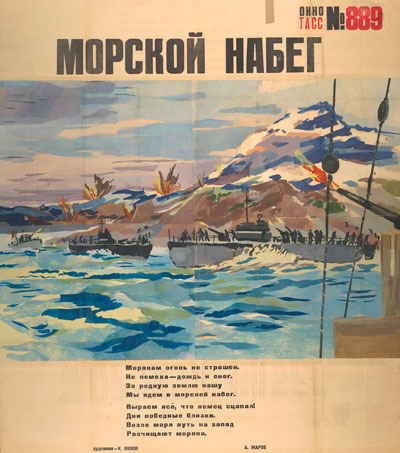 The poster campaign about life on the home front was crucial to maintaining morale and to a sense that everything was still functioning well in Russia itself. So the sky is mostly blue, the women strong and the Russian horses magnificent. Glimpses of destruction are seen, but are turned to suggest the gravity of the enemy threat. There was little work for the caricaturists here. Their skills were reserved for depicting the enemy. “Cleaning the streets”. 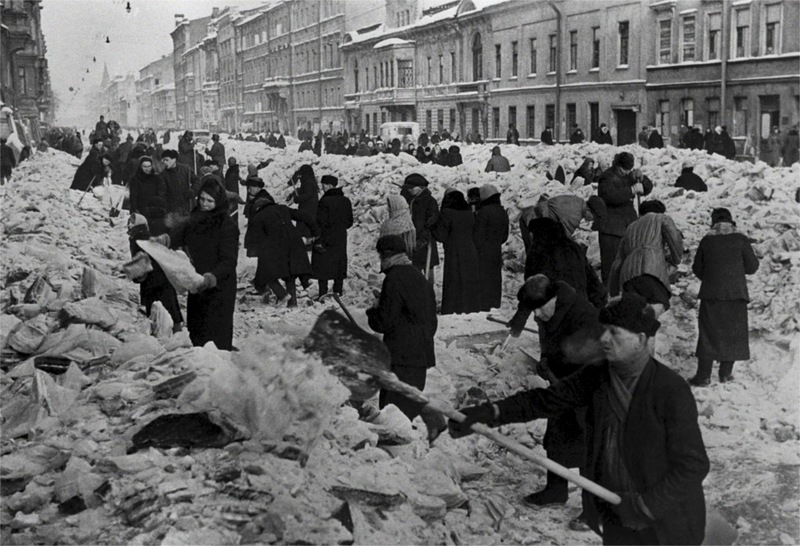 Leningradians cleaning a street after the first winter in the besieged city.